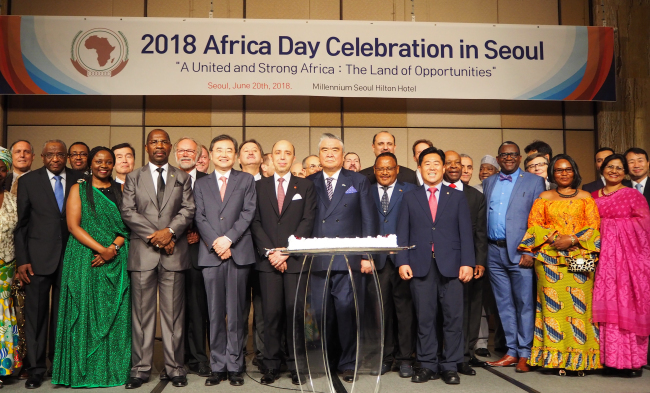 African ambassadors and diplomats marked Africa Day last week, celebrating the continent’s democratic progress and economic potential at a time South Korea is diversifying and expanding its diplomatic horizons further afield. “Today we celebrate the 55th anniversary of the erstwhile Organization of African Unity (the predecessor to the African Union, established in Addis Ababa, Ethiopia, in 2001), which was created on May 25, 1963,” Angolan Ambassador Albino Malungo, also the dean of the African Group of Ambassadors, said in a speech at a reception in Seoul on Wednesday. The African Union comprises 55 member states, including nearly all territory of the African continent. The union’s aims include achieving greater continental unity and solidarity; defending member states’ sovereignty, territorial integrity and independence; accelerating continental political, economic and social integration; and encouraging international cooperation, taking account of the United Nations’ charter and universal declaration of human rights. The objectives also encompass promoting continental peace, security and stability; championing sustainable development on economic, social and cultural levels; raising living standards; advancing continental development through science and technology; and eradicating diseases and safeguarding public health. “In order to unleash Africa’s potential to the maximum, the developmental path for Africa must occur along inclusive growth and sustainable development,” he stressed, adding the union was focused on securing its peace and prosperity by stimulating its economy. Pundits say the union faces a host of challenges, including health issues such as combating malaria and the AIDS epidemic; political issues such as confronting undemocratic regimes and mediating in civil wars; economic issues such as improving living standards of millions of impoverished, uneducated people; ecological issues such as dealing with recurring famines, desertification and lack of ecological sustainability; as well as legal issues regarding the disputed territory of the Western Sahara. Malungo highlighted the signing of the African Continental Free Trade Agreement in Kigali, Rwanda, in March. The accord, which was signed by 44 African Union member states but has yet to come into effect, aims to create a single market followed by an area allowing free movement of people and a single currency union, similar to the European Union. Steady efforts should be made to reduce corruption and nurture the growth of grassroots citizenries and democratic governance, as declared by the African Agenda 2063, he added. Noting the continent’s low economic productivity levels compared to East Asian, Latin American and other advanced economies, the ambassador said African countries could reduce technology gaps and poverty by tapping into Korea’s developmental expertise and strengthening cooperation in the age of automation and digitalization. Seoul hosted the 6th Korea-Africa Economic Forum and 53rd African Development Bank Annual Meeting in Busan in May, which covered mutual economic cooperation as well as comprehensive people-to-people partnerships. The forum -- divided into the economic ministerial conference and public-private partnership meetings -- analyzed possible investment projects in energy and infrastructure, information communications technology, human resources development, agricultural development, green growth support and sharing of Korea’s developmental know-how.